This week, the International Monetary Fund (IMF) released a new estimate of economic growth, revising their short-term estimate upwards because of the tax bill passed last December and other factors. The IMF estimates that real Gross Domestic Product (GDP) will increase by 2.7 percent in 2018, up from a previous estimate of 2.3 percent. This boost in growth will persist for a few years, with the IMF seeing a boost compared to prior estimates of 0.4 percentage points in 2018, 0.6 percentage points in 2019, and 0.2 percentage points in 2020. However, they also predict that accumulating federal deficits and the expiration of the tax bill will slow growth beyond 2022, slower than it otherwise would have been. In light of the increased fiscal deficit, which will require fiscal adjustment down the road, and the temporary nature of some provisions, growth is expected to be lower than in previous forecasts for a few years from 2022 onward, offsetting some of the earlier growth gains. In other words, the findings of the IMF are consistent with other analyses. The official dynamic estimate from the Joint Committee on Taxation (JCT) found a short-term boost in GDP of 0.8 or 0.9 percent from the tax bill, followed by no increased effect in the next few years, and a slowing effect as the tax bill expires and growing deficits accumulate. At the end of the decade, GDP would ultimately only be 0.1 or 0.2 percent higher as a result of the tax bill. In other words, the average effect over the decade would only be a growth rate boost of less than 0.02 percent. 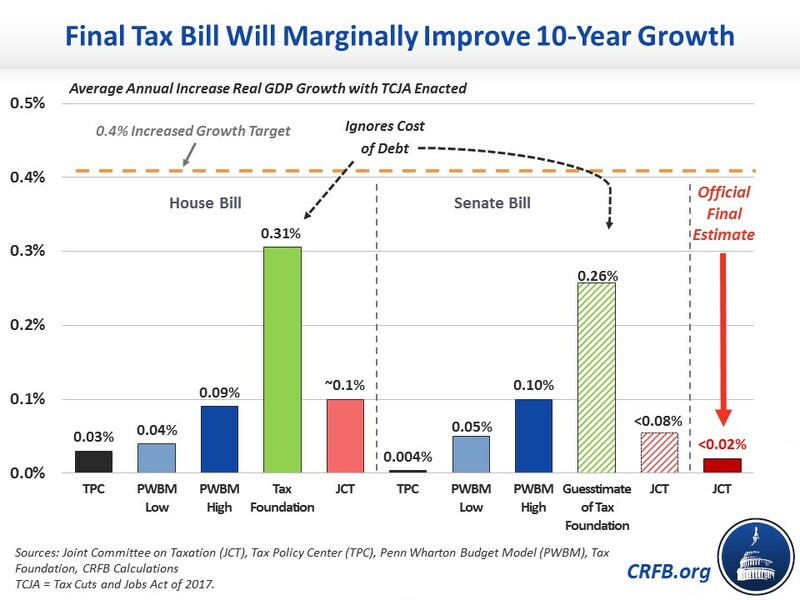 The Tax Policy Center also produced annual estimates of the effect on economic growth, largely concurring with JCT that the bill would produce a short-term boost of GDP being 0.8 percent larger than projected, but that boost would fade so there was little noticeable impact on the size of the economy after a decade. After 2025, many of the tax bill's provisions will expire, leaving only the negative economic effects of a higher debt crowding out private investment. The IMF report is consistent with other research on the economic effects of the tax bill: a short-term boost followed by a negative effect produced by higher debt. In order to counteract this negative effect, policymakers would be wise to consider deficit reduction through further base-broadening, rolling back some elements of the tax cuts, and/or spending reductions likely in the form of entitlement reforms.